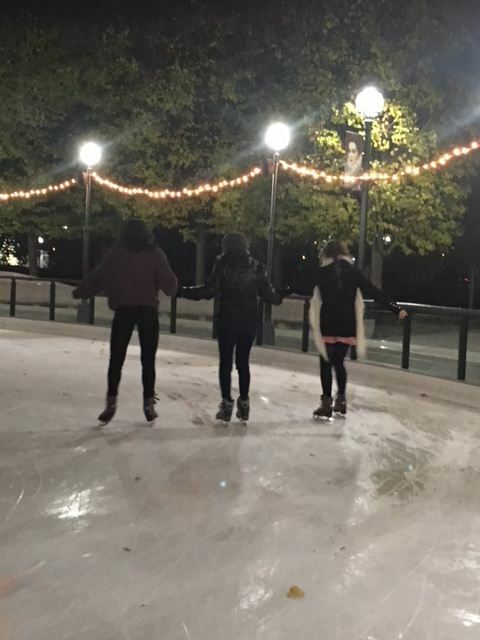 One of the real joys of my work this fall was a real world research trip I had the opportunity to take with our Art History Independent Study students. Inspired by last year’s Independent Study students’ fascinating final presentations, their teacher and I had the brainstorm to take this year’s students to the Library of Congress and Smithsonian museum libraries for some real world, close-to-the-art research. It was a bit of a pipe dream getting from Texas to D.C., but this August, we decided to make it a reality if we could. Part of the process was a wonderful collaboration with our art history teacher. We knew we would have to work together to help students refine their topics before the trip to D.C. The teacher, Melinda Darrow, added me to her Google Classroom so we could both communicate with students and so I could chime in on their topics as they developed them, asking questions or making suggestions. With that preliminary understanding, I started reaching out to various Smithsonian libraries to begin planning our trek. 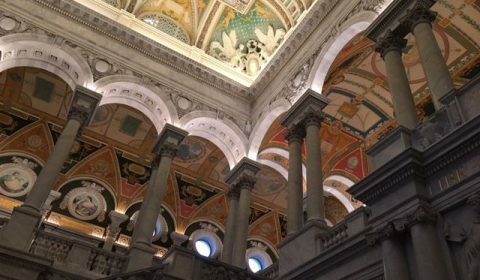 The Smithsonian libraries are free(like the museums)and most of them can be accessed by high school researchers (some require them to be over 16 years old). But many of them require appointments, or materials have to be pulled prior to the visit since they are located offsite, etc. So it took some focused planning to organize research opportunities for 24 different research topics. Just for an example, we had topics ranging from artist Yayoi Kurasama, the destruction of art in wars, Pop Art, the myth of Judith Slaying Holofernes, and another on the impact of art on tr ansportation and American tourism. I am so appreciative of the help of librarians at the Hirshhorn Gallery, the Freer and Sackler galleries, the National Museum of American History, the American Art Archives of American Art(which have an amazing online collection) , the American Art and National Portrait Gallery library, GWU Textile library, and the Library of Congress prior to our arrival, helping me navigate the maze of Smithsonian library offerings and rules. Their help and enthusiasm for our students made the process such a positive one for all of them. 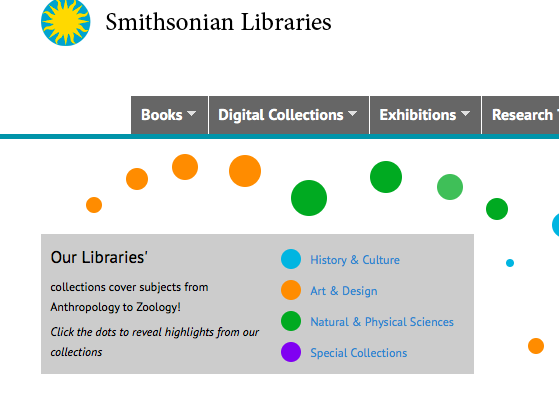 The Smithsonian libraries all operate under one catalog located off of their main site, where you can also locate journal articles or use their “one search” to search across all their resources. As part of the planning, I conferenced with each student and taught them how to navigate the Smithsonian catalog specifically to determine which libraries held materials they wanted to see. We also conferenced with every student to help complete an application for a Library of Congress library card and to figure out how to navigate the LOC catalog–you can enroll online ahead of time for a card and then just finish the last steps onsite. We helped students map out a plan for each day and which libraries they would be using and coordinated a group visit to the Library of Congress as well. This was such a tremendous learning experience for me, having never used these libraries before, as well as for our students. 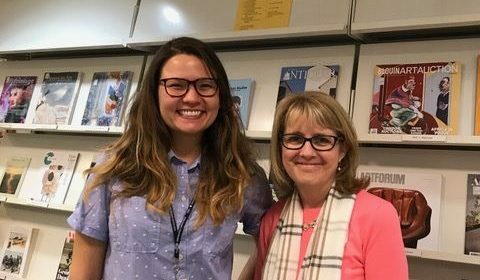 But when school leaders wonder about the power of having a certified librarian in their school, this project is evidence why it makes a difference. 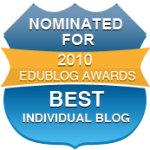 I knew these resources were available, knew how to interpret the results we found, knew how to reach out to the other libraries and knew the differences between the types of libraries available to them. The trip itself ended up being a fantastic one. 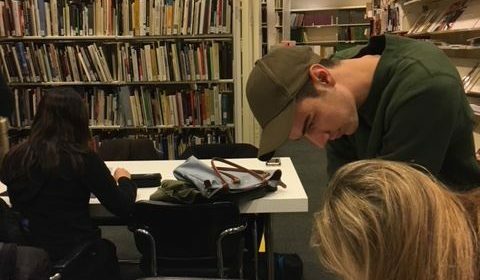 We split the students into groups so that the teacher or I were in the vicinity of each group of museum libraries, and then we were able to check in on them. On Friday, we all dispatched for the museum libraries. 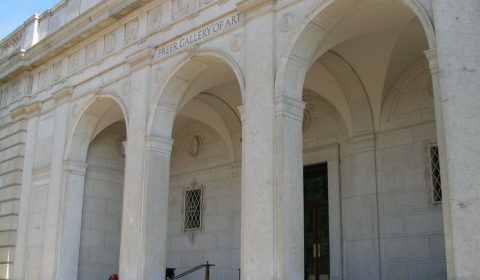 I accompanied students to the Hirshhorn and Freer/Sackler. The students were planning to visit one site in the morning and a different library in the afternoon, although some ended up staying at one location all day because they found such a wealth of materials. Our student researching textiles of India ended up finding a wealth of resources at the National Museum of American History and spent the whole day using their textile collection. Several of the librarians already had materials waiting for us, while others consulted with students when they arrived to help them find the best materials. One of the delights of using the Hirshhorn library was all the file folders they had on different artists. 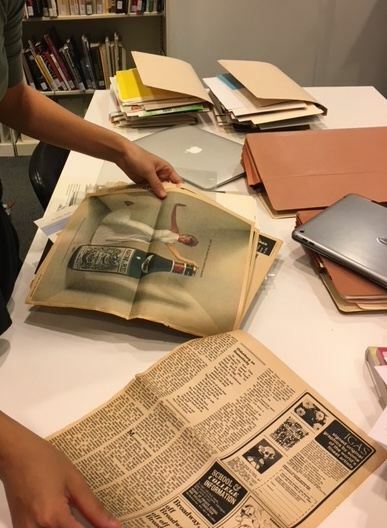 Their library had one librarian for around 30 years who curated materials from art shows and art curators so she had collected a huge sampling of ephemeral materials, like invitations to Andy Warhol shows in the 70’s, flyers, articles, photographs, etc. that students could wander through. It was so exciting for the students to handle these materials. 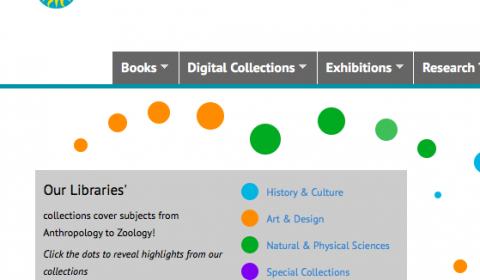 Another student was able to tap into the vast art databases of the Smithsonian which they had to use on site, but certainly couldn’t access from our school. 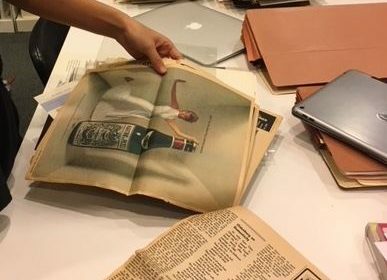 One of our students who was studying digital art was concerned she might not find much information, but the librarian at the Freer gallery located a wealth of materials from their Japan collection about digital art in Japan. For our student studying the destruction of art in war(who was mainly focused originally on World War II), a number of materials on the destruction of Buddhist art in various conflicts around the world. The National Portrait Gallery librarian located similar file folders on Diego Rivera as well as stacks of books and magazines for students. 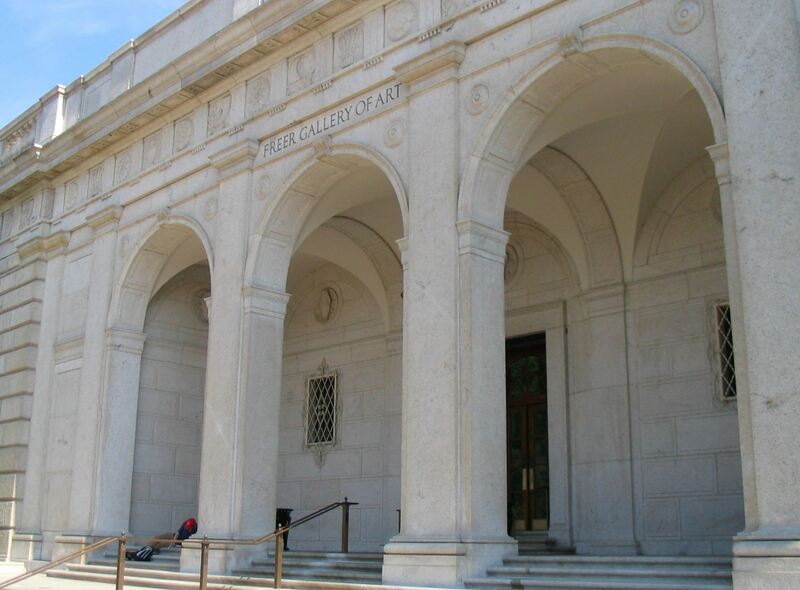 And the American Art Archives next door had the entire set of papers from the Monuments Men so had a wealth of resources for our student. The majority of the students were so into the research that they barely broke for lunch and worked for eight hours taking notes and handling materials. Just hearing the joy of their discovery and seeing their excitement at handling materials we wouldn’t normally have access to was so rewarding. 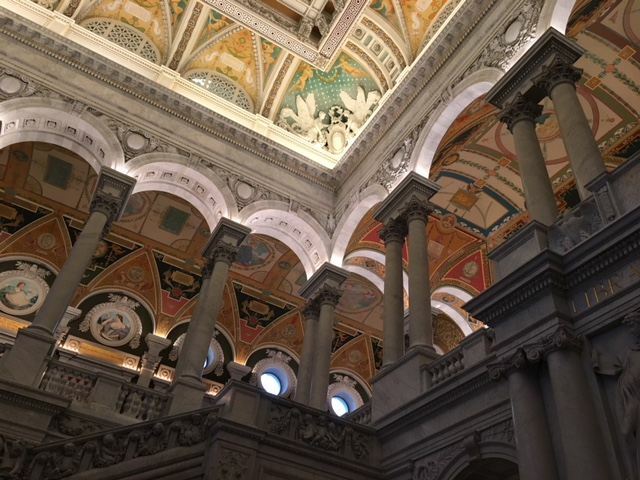 On Day Two, we all journeyed to the Library of Congress for a day of research there. We all got issued Library of Congress reading room cards, which took awhile since our whole group arrived at once. Then we were given an orientation on how to locate and request materials in the Library of Congress since they are closed stacks. Students had done preliminary research before we arrived, so they had a sense of what they were interested in. The greatest fun was that since we came in through the basement and went straight to the orientation, they had no idea of how ornate the building or reading room was. When we finally finished the orientation and they walked into the reading room, it was so fun watching them gasp and look up at the ceiling and ornate room and just marvel at it. It was such a fabulous moment. They were also very enamored of the idea that they got to request books to be delivered to their tables. 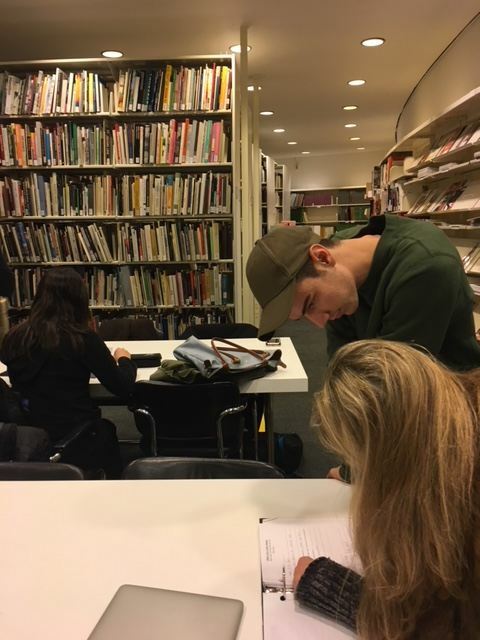 Again, some of the students worked all day taking notes and scanning books, while others left at lunch to go to the National Portrait Gallery to see works by the artists they were studying. 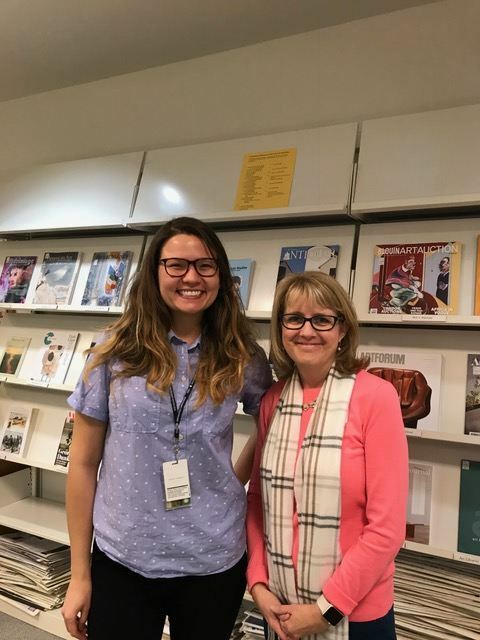 I stayed myself doing research on the history of libraries and it felt so amazing to do be doing that research in that beautiful space(and Melinda and I might have gotten a little behind the scenes tour, too). 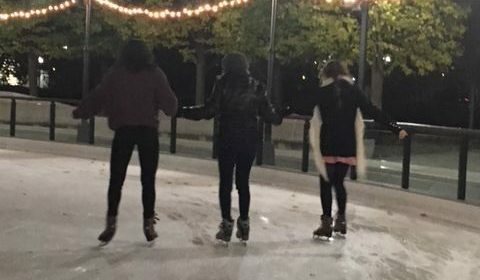 And many of us capped the day off ice skating at the National Sculpture Garden that night. The last morning we spent at Smithsonian museums(not enough time) so they could see artworks that they’ve studied in class. One of the other great outcomes of the trip is both myself and our students really discovering the power of Interlibrary Loans and that they could have access to some of these materials at home. (Some libraries like the Freer, aren’t able to lend their materials except for one of their collections). Upon our return I reached out to our local community library, Westbank Community Library, and they sent a librarian over to our campus to conference with our students and show them how to request a book through interlibrary loan. We had several who have requested books so far. The value of this experience to these students is immense. They now understand what a vast amount of resources in all sorts of libraries they have as researchers, no matter what field they go into. They understand how librarians at all different facilities can help them, and they understand that there are digital archives, too. They know that they as individual Americans they can have access to the largest library in the land. And I hope through our collaborations at school that they understand that librarians want to help them and that this lesson will carry into their interactions on future projects and research, whatever it is. Their teacher also helped show them how we can be educational partners and work closely together to further their work. It was such a joy to have so many of them tell me it was the best trip they had ever taken–who would ever think a research trip would be that for them? Thanks again to the librarians at the Smithsonian libraries, Library of Congress, and Westbank Community Library for their help. We are extremely grateful! If you want to ever know what a difference a certified librarian can make, this is the difference.